Hurricane Irma’s violent and selective deforestation of the woods surrounding my Atlanta-area home has left me without power for over 36 hours. One of the few saving graces has been knowing that once I got back to the new Dungeons & Dragons idle clicker, I’d have billions of gold waiting. Idle Champions of the Forgotten Realms is a Dungeons & Dragons-themed game from Codename Entertainment, currently in early access of Steam. Beginning with the Realms’ foremost dwarven hero, Bruenor Battlehammer, players form a party of legendary heroes and send them off on automatic adventures across D&D’s most popular campaign setting. The eyes, Boo. Go for them. The party automatically travels through a series of stages, using their attacks, spells and other abilities to take out increasingly powerful enemies. As the enemies fall, so does gold, the resource required to purchase and level up characters. Should the enemies grow too powerful for your party (and your assistive click attacks) to handle, you can just walk away. This is an idle game, so the party marches on if you close the game, go to get a sandwich or have trees fall on power lines, causing an explosion that leaves you without power for at least a day and a half. What’s really cool about Idle Champions of the Forgotten Realms is the game actually has a story structure. Players send their party on a mission to, for example, deliver a message to a remote village. Once that mission is over the whole thing starts over with a new adventure. Bruenor is alone at level one once more, though any items earned through chests or questing remain in the party’s inventory. 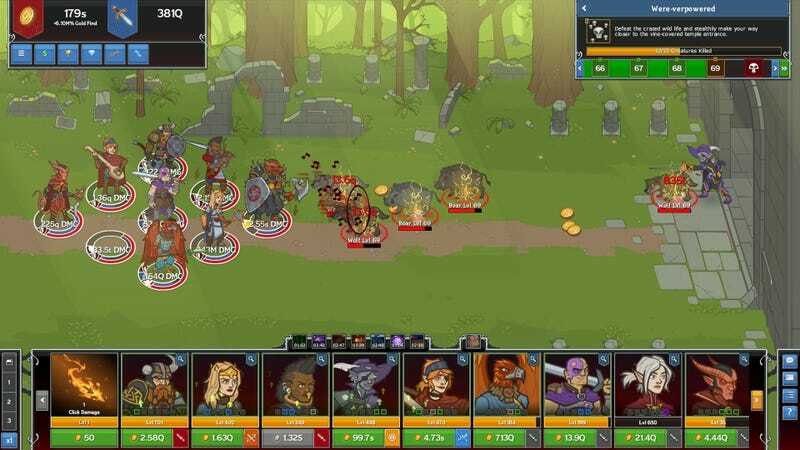 Idle Champions is a free-to-play game, so it is supplemented by in-game purchases. Chests containing special equipment and gold can be purchased to help the adventurers get further, faster. But good things come to those who wait. I managed to score a few hours of power at a friend’s house this morning, and look what was waiting for me. I made 741 billion gold, and all I had to do was be pretty miserable for a day and a half! That’s a whole lot of gold! I’m almost looking forward to seeing what the tally is when my power finally comes back on. I should call Georgia Power and tell them to take their time. No, really, please get our power on as soon as possible, I am going insane.